On Wednesday, Page 2 ran its list of the biggest upsets of all-time. We asked for your take, and you filled our mailbag with plenty of opinions. Not only the biggest sports upset of all-time, as a matter of fact, but this event had an impact on so many different levels. 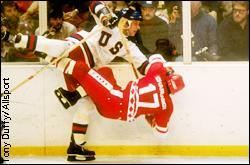 This was a political event where democracy won out over communism for one night on the ice and also said something about the attitude of sportsmen in terms of professionals vs. amateurs --need we discuss the Nagano debacle with U.S. professional hockey players? But more importantly, everyone in the United States shared in this moment. When the Yankees win the World Series, New York cares. When the Bulls win the NBA title, Chicago cares. But for one night, people who didn't know a two-line pass from an interference call were fans of the U.S. hockey team. At a time when a country mired in malaise needed something to rally around -- the spirit of a group of young men at Lake Placid, N.Y., filled that prescription. That simply had everything going for it. The Cold War overtones of the unstoppable, evil Russian empire and their team of professionals vs. the babyfaced kids representing all that was good about amateur sports in the Olympics. Truly a David vs. Goliath story -- these two teams didn't even belong in the same league. The upstart Americans knocked off the mighty Soviets in the Olympic medal round. We had a dinner party that night and as the game wore on (no one was allowed to listen to results earlier), everyone stopped eating. You couldn't take your eyes of the screen. I will never forget the anguishing excitement of the last few minutes that seemed to last for ages ... and Al Michaels' call has to go down as simply one of the best big-moment calls of all-time. The scenes after the win will always be etched in my mind, the incredible pile of bodies out on center ice, the sticks heaved to the heavens, the smiles of unmatched exultation on the players faces and, of course, Jim Craig, draped in the flag. I suspect that for many of those young players it will remain the single greatest moment in their lives. It is certainly the most memorable sports moment of mine, upset or no. Tyson was a pit-bull. He was on top of the world and he demolished his opponents. The way he just mowed down boxers with extreme power, intensity, and viciousness always had the boxing world and myself in awe. Buster Douglas gained his 15 minutes of fame by knocking out Mike Tyson. To think that a no-name, Joe Schmoe named James "Buster" Douglas, whom everyone thought Mike Tyson would pummel to the canvas, enters the ring and publicly humiliates Tyson with a TKO would have never crossed my mind. Mike Tyson was also a heavy favorite and in everyone's eyes he was "The Man." To watch Douglas destroy Tyson, and leaving Tyson dazed, barely putting his mouthpiece backwards into his mouth after being knocked down, will always remain to me, the greatest upset in sports' history. At the time, Mike Tyson was truly the greatest, unbelievable fighter. I remember watching it live and being absolutely stunned. 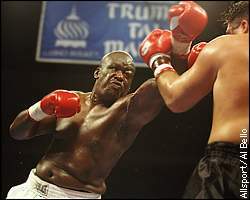 Nobody could even faze Tyson and yet Buster Douglas was turning him into a slab of meat. I remember jumping up and down in disbelief when Tyson finally got knocked down. In the team sports, upsets are expected, and it's not like people didn't think it could happen (baseball -- Mets, football -- Jets, basketball -- Nuggets, 'Nova, and NC State), but with Buster Douglas beating Mike Tyson, no one expected it. American Rulon Gardner, left, will go down in wrestling history for his stunning 1-0 defeat of Russian great Alexander Karelin. Rulon Gardner's victory at the Sydney Olympics is the greatest upset in sports history. He had no team to rely on. In the minds of everyone looking on, except maybe his family and coach, he had no hope of beating Karelin. He had no history of winning at that level of competition. Most impressive of all, though, is the "loser" in this upset. Karelin had been undefeated and unscored on in international competition for the decade preceding the Olympics. That's like the 1970s era Steel Curtain going the entire decade shutting out every opponent and winning 10 straight Super Bowls, or Pete Sampras winning 10 straight Grand Slams going 6-0, 6-0, 6-0 in every match. I think that the biggest upset was the 1991 NCAA Tournament semifinal game between the Duke Blue Devils and the UNLV Runnin' Rebels. UNLV was heavily favored and had not lost a game all year. Duke put up a gritty performance from the likes of Christian Laettner, Bobby Hurley, Grant Hill, and Thomas Hill. It was just a great win for the Duke program and really helped put them on the map as national title contenders for years to come. My vote goes to the Villanova upset of Georgetown in the 1984 NCAA final. The fact is that, talent-wise, 'Nova was so inferior to Georgetown that they should have been run out of the building by the Hoyas. But by the grace of God they shot better than 75 percent from the field and 90 percent in the second half, and still only won by two points. Here was a team playing better than they could ever have imagined in their wildest dreams and they were only able to win by two. That tells you how much of a mismatch Georgetown was for them. 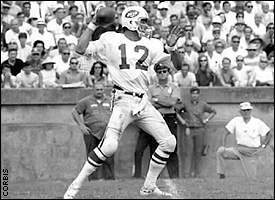 Jets quarterback Joe Namath backed up his boast in Super Bowl III. Super Bowl III. It changed the landscape of pro football, lending immediate credibility to the impending merger -- and that's just the aftereffects. On the field, it was as shocking a result as most my age (45) have ever seen. I'll never forget it -- and that's coming from a Packers' fan. Chaminade over the University of Virginia -- 1982-83 season. With 7-footer Ralph Sampson leading the way, the University of Virginia was the No. 1-ranked team in college basketball and expected to walk right through the competition in the tournament in Hawaii. Enter Division II Chaminade. After replicating Sampson's size by having a player stand on a chair during practice, Chaminade surprised and embarrassed the top-ranked Cavaliers. While UVa rebounded to still post a strong season, you have to wonder if the doubt put into their heads on that night helped contribute to a pair of late-season losses to another David, eventual NCAA champion NC State. One of the greatest moments in college hoops, where the Pack showed its heart and Jimmy Valvano became a God to not only the Wolfpack faithful but also all those who love to pull for the underdog. They won a game that was considered to be won by the great Houston team before the opening tip. We still love you, Jim! The biggest upset in sports history was 100-to-1 underdog Upset beating heavily favored Man O' War in the Sanford Memorial. Willie Knapp, who rode Upset, the horse whose name has come to mean "to defeat unexpectedly," described his victory best: "We'd passed the quarter pole and were going to the eighth pole, I guess it was, and I heard something right behind me and I knew it was Big Red (Man O' War) coming at me now. I looked back and there he was. Johnny Loftus was riding [him] like a crazy man and he yelled at me, 'Move out, Willie! I'm coming through!' So I yelled back at him, 'Take off! Take off me, bum, or I'll put you through the rail!' Then I set down to riding and we won." Man O' War had 21 starts in his racing career and he won 20 of them, only being upset once. Thus his defeat in the Sanford Memorial by Upset must be considered the greatest upset of all time. Definitely the 1969 Mets over the Baltimore Orioles. An expansion team over the powerhouse Baltimore team with recent successes. The Orioles had some of the best pitchers of the day led by future Hall-of-Famer Jim Palmer and a powerful lineup including Frank Robinson, Boog Powell, Brooks Robinson among others. Don't forget that the "Amazins" (as they were called) actually lost the first game and still won the series.